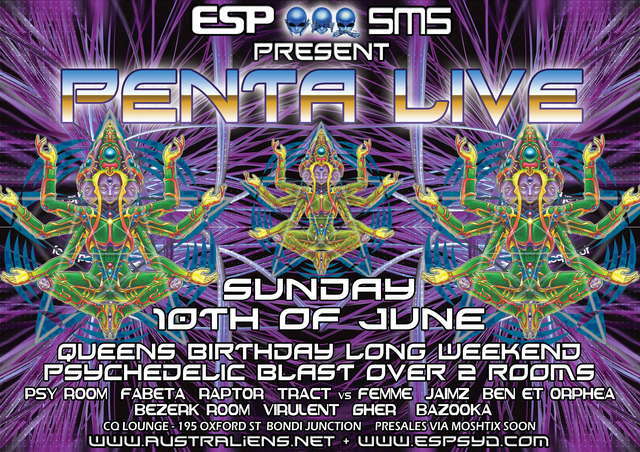 SP, -sMs- and BERSERK team up to bring you a twin room monster event on Sunday10th June (Queens Birthday Long Weekend) with a very special guest PENTA from SanFrancisco/Portugal performing live for the first time alongside some of Sydney's finest Dj's. Endless traveling, constant noise of the parties, life in hotels, as well as a considerable dose of couch-surfing, has accumulated in Penta’s head into something that resembles the chaos of Indian street traffic. Horn Please – the message that is written on the back of the sub-continent’s trucks could never been more appropriate to describe the desire to bring order to trance musician’s life. This CD, executed in the style of a Mumbai taxi, is a dedication to the crazy party life in the form of a collection of morning and night psytrance tracks, sometimes written in headphones in different parts of the globe, and already successfully tested on the biggest dance floors of the planet. Faster BPMs than in his previous albums, as well as the use of the latest technologies, makes “Horn Please” one of Nikita’s most psychedelic works to date. DJ, Gher is the man behind the 'Opposition' nights at the Livehouse which has featured Mark N and Episilon amongst others. Playing a mixture of hard Industrial and Dark Psytrance in his sets, Gher more recently played Berserk as the special guest Dj.